Intersect Digital is relocating to this Victorian home on West Huron. An Ann Arbor digital marketing firm that has quietly lent its talents to several popular Super Bowl ads is undertaking perhaps its highest profile project yet as it prepares to move into a fully restored Victorian home that dates to the Civil War era. Intersect Digital founder and Chief Executive Kraig Rasche purchased the 6,200-square-foot home at 709 W. Huron St. in January for $707,000. He plans to move his firm into the building as early as April 1. The two-story, wood-frame brick home was built in 1865, city records show. The home last underwent major remodeling in 1955, and Rasche said he believes it has housed commercial businesses since at least the 1970s. Workers have already completed inspections for electrical, demolition work, plumbing and HVAC systems and were expected to have completed final rough inspections. The home also features hardwood floors throughout, except for the bathrooms, where workers are installing Victorian tile. The trim and molding are all original oak and remain in good shape, Rasche said. He also plans to paint only with colors available during the Victorian era. Intersect Digital has mostly flown beneath the radar during its time in business, which is just how Rasche, an entrepreneur who previously owned an automotive engineering company, likes it. Now in its 12th year of doing business, the company, which started its life as Sagient, designs Flash banner ads, Facebook apps, websites, games, mobile and email campaigns and other digital promotions for advertising agencies. Samples of the company’s work include campaigns for brands like RadioShack, Crocs, Columbia Sportswear and Toyota on behalf of clients including Saatchi & Saatchi, McCann Worldgroup and Anchor Bay Entertainment. Citing competitors and non-disclosure agreements with clients, Rasche declined to discuss annual revenue, how much he’s spending on renovation work, the specific Super Bowl ads the firm worked on (he said only they were among the “most popular” and “most brand-recognized” commercials during last month’s game) or how many people he employs. The company is currently housed at the Allmendinger Building at 130 S. First Street. But Rasche, 47, said his company is growing and has been profitable year over year and is benefiting from the larger shift in advertising. Online ad spending is growing by double digits and is on course to overtake spending on ads for magazines and newspapers this year for the first time, according to a recent forecast by eMarketer. The company will take “great pains” to keep its technology infrastructure needs hidden among the home’s historical amenities, Rasche said. The home was previously owned by 709 W. Huron LLC and Richard W. Pierce, an immigration attorney who had owned the building since 1995. It was given an assessed value this year of $296,500, down from $333,100 in 2009. Grant Bruce of Signature Associates represented Rasche Holdings LLC in the purchase. • Contact freelancer Sven Gustafson at sventg123(at)gmail(dot)com, or follow him on Twitter. So happy it's going to someone who plan to raise it rather than raze it. Ann Arbor has some lovely architecture. Unfortunately few are in a position to properly renovate for historical value. This is really good news. Sun, Mar 18, 2012 : 9:53 p.m.
it was called the Martha Washington House for many years. 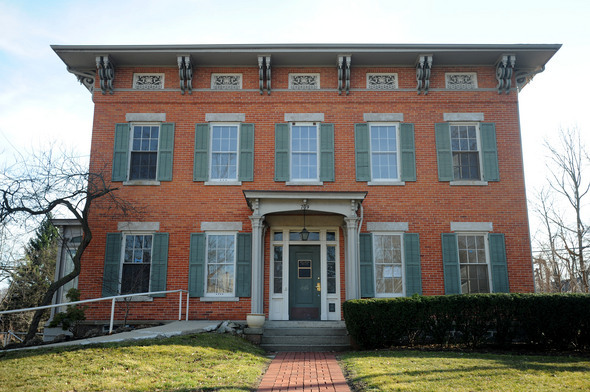 Its historic name is the John Gott house. Sun, Mar 18, 2012 : 8:35 p.m.
Sun, Mar 18, 2012 : 7:54 p.m.
Sun, Mar 18, 2012 : 5:27 p.m.
Sun, Mar 18, 2012 : 3:35 p.m. The tax assessment should be 1/2 of the market value. An assessment should always lag a little in an improving market. An assessment of almost $300k indicates a market value of $600k. That is a pretty good assesment on a property that then sells at $700k in the spring in an improving market. That is especially true for a unique, niche commercial property that will require a substantial investment in order to bring it up to date and complete a &quot;build out&quot; for the new tenants. The &quot;True Market Value&quot; of any property really isn't known until the actual property changes hands. Everything else is an estimate. The new assessed value based on the sale price would be $353k. That represents a 19% increase in value since the last assessment (using actual numbers.) And only a 6% increase over the 2009 number, representing the swings in commercial valuation in the past few years. Most of the 19% increase - at least 10% - is attributable to current improving market conditions and assessment lag time. Most homes would not (should not) require renovations or updates to improvements last brought up to style and function in the 1950's. If the assessment were any higher, 50% of assessments would be wrong on the high side. Many, many owners would see it as worthwhile to challenge the assessment, and would be right. Of course that extra workload would cause chaos for the system, as a board would have to adjudicate each appeal. Overall it sounds like an affirmation that the system is fairly accurate. This is surely a beautiful building. Nice to see a successful company put effort and thought into preserving. What gets me confused. This historic Victorian home with 6,200-square-feet costing $707,000 is only assessed at $296,500. I have a home close to one third the footage and didn't pay anywhere near $707 k. Yet my assessment is $226,100. Clearly this tax collection based upon real estate is not fair at all. It is about time Ann Arbor changes the way it collects taxes so we are all paying the correct and fair amount. Sun, Mar 18, 2012 : 3:50 p.m.
Sun, Mar 18, 2012 : 3:11 p.m.
That $296,500 is for 2012 and was determined before this sale. I'd assume that next year it will indeed be higher. So great to have young talented companies like this in Ann Arbor. Kudos to Mr Rasche and his investment in both people and real estate in Ann Arbor. We are lucky to have entrepreneurs like Mr. Rasche.